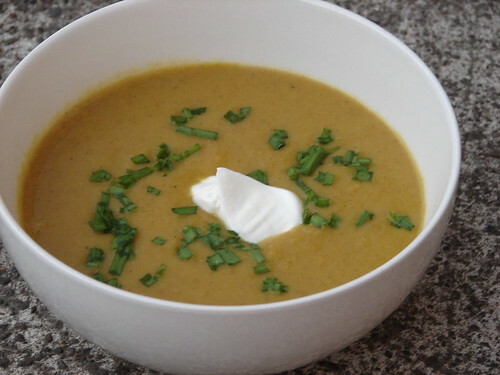 A great dish to make if you have a lot of celery on hand is a curried celery soup. This recipe is wonderfully balanced and quite tasty. 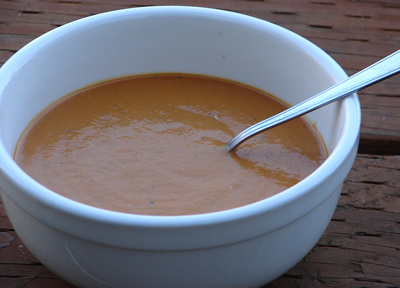 You might think that celery doesn’t have much taste, but in combination with curry, cumin, apple and of course onion, carrot and potato, this soup is quite flavorful. The curry hints in the background and is not overpowering and the apple lends some sweetness. We also utilized celery leaves which lends some nice crisp color. Once this soup is blended it will take on a beautiful green shade. Sauté the onion, carrot and celery in some vegetable oil for about 10. Add the potatoes, sauté for another 5 minutes. Add the garlic, the apple and the spices, continue to sauté for a few more minutes. At this point add the broth, scrape the bottom of the pan and bring to a simmer. Cook for another 10 minutes and then add the celery leaves and cook for another 5 minutes. Now blend the soup (or parts of it if you like chunks.) Salt and pepper to taste and serve. Name: Frances Comment: Turned out very yummy. I didn't have an onion, and added an extra carrot and some parsnips. Used beef broth, about one cup more, didn't blend it. Served it over a little rice, added some salt and lots of pepper, and a dollop of vegan sour cream and some diced up Tofurky slices. It was delicious. The cheese eaters added some grated Asiago. That does sound good. I like the idea of serving it like a stew over rice with Tofu.